Did I tell you I have a new website with blog? Guess what it’s about. Bingo! Eggs & Chickens! The chickens in hardhats are still working on building stuff, but the blog is up and running. Today we feature another blogger, Lisa S. from Fresh Eggs Daily. Read about our chicken talk here. 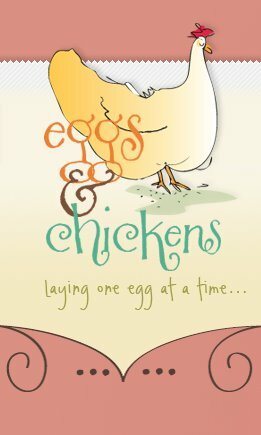 Eggs & Chickens will be a basic resource for people interested in learning about starting out and raising backyard chickens. And since most people I know who have backyard chickens have eggs coming out of their ears, I’ll be sharing recipes that use up some of those eggs. Sorry, no chicken recipes on this blog. Come on over for a visit. Welcome Lisa and let me know what you think. Do you mind if I quote a couple of your posts as long as I provide credit and sources back to your weblog? My blog site is in the very same area of interest as yours and my users would definitely benefit from a lot of the information you present here. Please let me know if this alright with you. Thanks a lot! Robin, your new blog will be a big hit, I predict! There is a big “chicken revival” now — people need good, solid information and how-to’s, especially when presented with a steady dose of humor. I am personally interested in the topic of keeping chickens safe in urban/suburban environments, as predators lose their habitats. I’ll be visiting Eggs and Chickens, for sure. Best of luck to you!